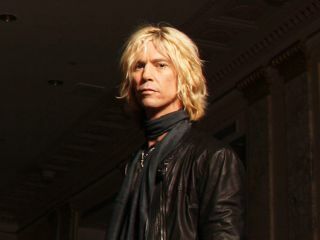 "Velvet Revolver needs the best singer around"
Duff McKagan has spent more than 20 years in the rock 'n' roll fast lane, first as bassist for the legendary Guns N' Roses and now as a member of Velvet Revolver. After all this time, he's still keeping irregular hours. As proof of this, on the day of his interview with MusicRadar, McKagan rescheduled our conversation three times. But the reason wasn't what you would think: he and his wife, Susan, had to attend a parent-teacher conference (the couple have two daughters, Grace and Mae Marie). "Going to talk to my little girl's teacher is a far cry from what people probably think I spend my time doing," says McKagan during a pre-interview chat. "But after wasting years trying to kill myself with drugs and alcohol, and coming close to succeeding, real life is a relief. Unfortunately, there's other people who haven't gotten that message." McKagan could be speaking about anybody, but during our talk he makes it clear that he's speaking about ex-Velvet Revolver singer Scott Weiland, and he makesno bones about the fact that the real reason for the singer's dismissal from the group was his unrepentant drug use. "The people around him, they don't really care," says McKagan. "They just want to keep him out there. But the thing is, if you really want to change, you've got to do it yourself." These are busy days for McKagan, who divides his time between Los Angeles and his hometown (and now home base) of Seattle, Washington. In addition to rehearsing with potential replacement singers for Velvet Revolver, he's been touring with his side band Loaded, in which he plays guitar and sings lead. (They'll have a new EP, Wasted Heart, out soon.) He also pens a weekly column for the Seattle Weekly. In a frank talk with MusicRadar, McKagan spoke about the Velvet Revolver singer conundrum and about the problems the band had with Scott Weiland. He also talked candidly about his relationship with Axl Rose and his thoughts on Chinese Democracy. And he happily strolled down Guns N' Roses memory lane before answering your questions.